For twenty five years, we have been exploring the art of puppetry. As a builders and designers, we revel in creating circus troupes out of ping pong balls, monkeys out of fur coats, and papier-mache crocodiles. As performers, we delight in giving inanimate objects the illusion of life. We all know that goblins aren't alive, for instance, but we (the performers and the audience) agree for a minute to believe that they are. The puppeteer's job is to create in her imagination an image of that goblin that is so real and complete that we all forget they are not alive. If that image is strong enough, an eerie thing begins to happen: we start to see things that aren't actually there. Our imaginations fill in what's missing, and this is where puppetry gets very exciting. Did we just see an eyebrow raise up in surprise? Did that puppet just blink? A minute ago, the goblin was crying, but now the same face appears to be laughing. Puppetry is a collaboration between the puppeteer's and the audience's imaginations. 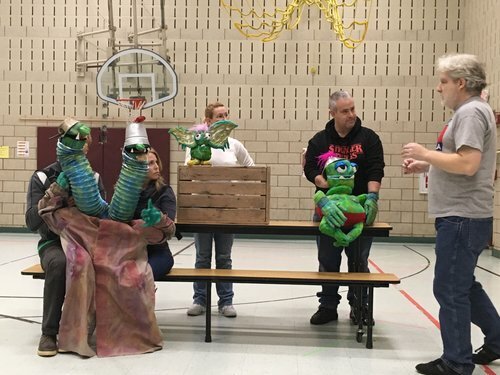 Our favorite performances are the ones where the performer's imagination meets the audience's imagination at the edge of the stage, and they explode in a magical moment of the puppet springing to life. When this happens, everybody in the room feels it on a primal level, and suddenly, the room is filled with real goblins. If this is your first experience watching puppets in action, get ready! You are about to enter a world where anything is possible if you can only imagine it. Interested in learning more about the Art of Puppetry? Check out the Puppeteers of America and the Twin Cities Puppeteers Guild and the international organization of puppetry, UNIMA-USA.